Use the image below to select a section through the brain. Click on a button to view the corresponding section, or use the numbered guide in the frame below. Scroll down for more background on this atlas. The markers above are spaced 1 mm apart and correspond to levels of the Atlas. 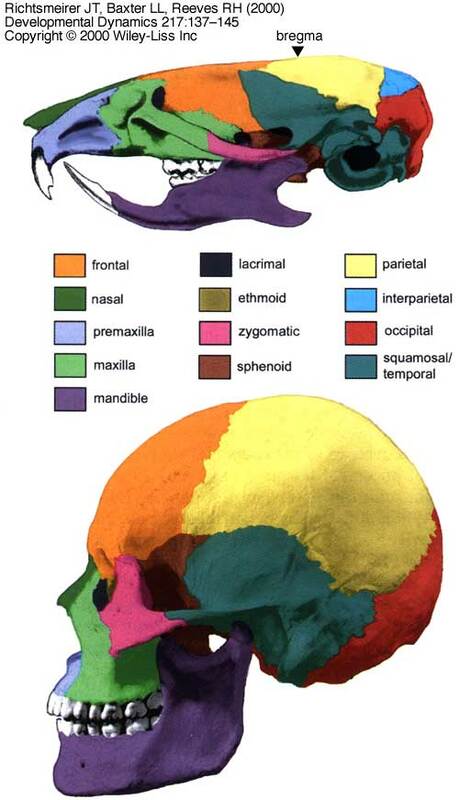 The zero coordinate is the bregma point, a landmark visible on the skull. To use this atlas effectively you may need to assign your browser more memory than usual. If you are connecting at 56K you will also need patience. The jpeg-compressed images are 500K to 2800K. Note: If using Internet Explorer on a Macintosh, the image will only show 3000x3000 pixels. Note that the actual images are about 4800x2800 pixels. Downloading any image and opening it in an image editing program will work fine. If you are running Mac OS X, we recommend using Safari to view these pages. About this A/J Horizontal Atlas: The brain is that of a 365-day-old A/J female with a body weight of 22.8 grams and a brain weight (fixed) of 158.2 milligrams. In vivo brain weight was 386.4 mg. The animal's celloidin case ID number is 005 and you can view one of the two slides used to make this atlas. Shrinkage during fixation and processing is 25.6% (linear). The in vivo grid compensates for this shrinkage. The abbreviations we have used to label the sections conform to those in the Franklin-Paxinos atlas (The Mouse Brain in Stereotaxic Coordinates, Academic Press, San Diego, 1998, ISBN Number 0-12-266070-6). 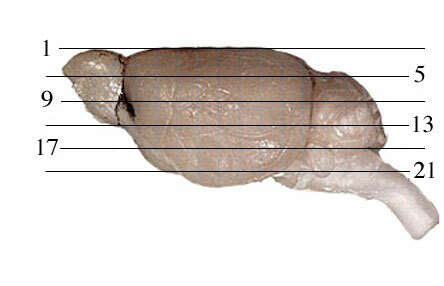 The brain and sections were all processed as described in our methods section. The enlarged images have a pixel count of 4744 x 2879 and the resolution is 2.66 microns/pixel for the processed sections. All images are 8 bits per RBGB channel JPEG images. Plans: In the next several years we hope to add several additional atlases of the same sort for other strains of mice. A horizontal C57BL/6J atlas and a C57BL/6J coronal atlas were completed by Tony Capra, summer 2000. The DBA/2J horizontal color atlas was completed by Aida Causevic, July 2001. This A/J horizontal atlas was completed by Evan Williams, August 2002. We plan to produce additional atlases over the next several years. As described in our MBL procedures section, it is not hard to make your own strain-specific atlas from the high resolution images in the MBL.